This component may need a little explanation. It generates random integer (DT_I4) and string (DT_WSTR) data and places them in the pipeline. You can specify the column count for each type of column which defines the output. You can then set the number of rows to generate during execution. The component acts as a source within the data flow, allowing you to quickly build test packages for research and proof of concept. It is also well suited to benchmarking since the data is generated internally, and less open to external influences. The Data Generator Source is available free of charge from SQLIS.com, our free community resource site for SQL Server Integration Services. 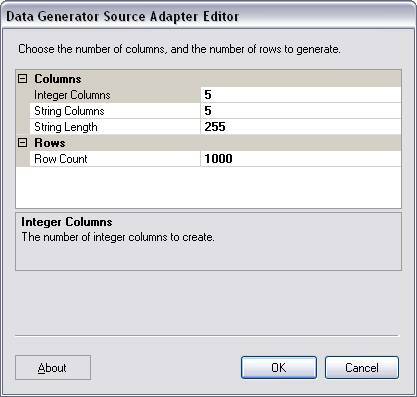 The Data Generator Source is available for both SQL Server 2005 and SQL Server 2008, and will include support for the automatic upgrade of packages between 2005 and 2008.